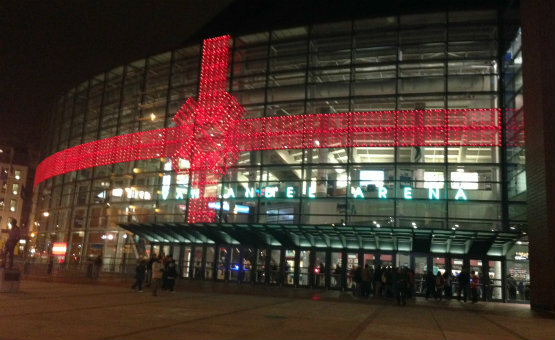 Van Andel Arena-Grand Rapids, MI: I hope this post finds that everyone had a safe and very Merry Christmas! 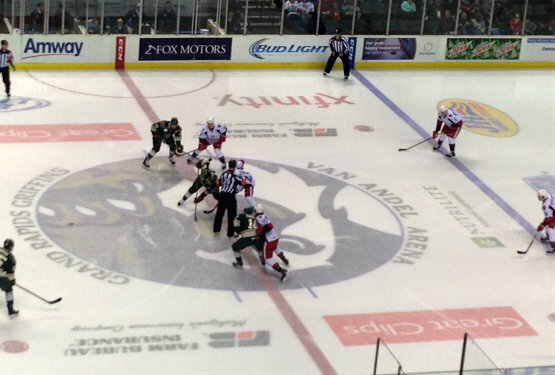 To celebrate our holiday, we headed downstate to visit family, and to keep busy, took in a hockey game. 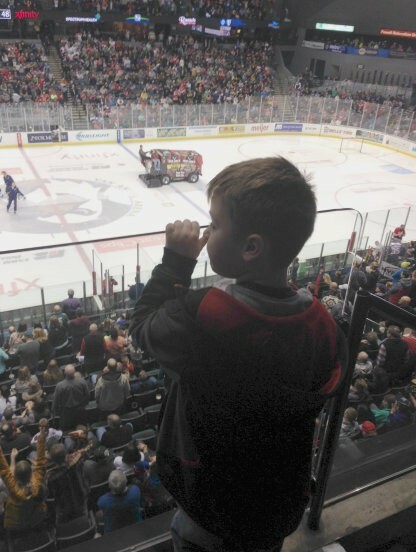 There are really only two seasons in our eyes, baseball in summer, and hockey in winter, so we spend many nights at the rink when the ballparks are covered in snow. 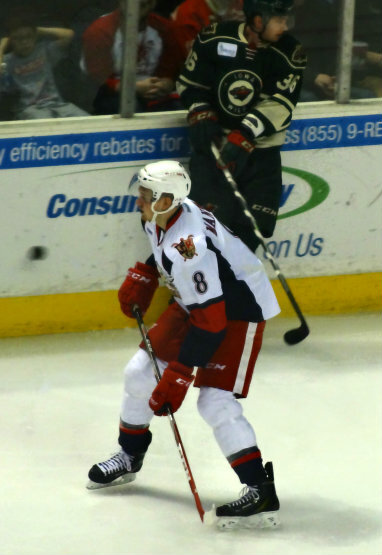 On this night, Brian and I went with Papa to see the Griffins host the Wild at the Van. 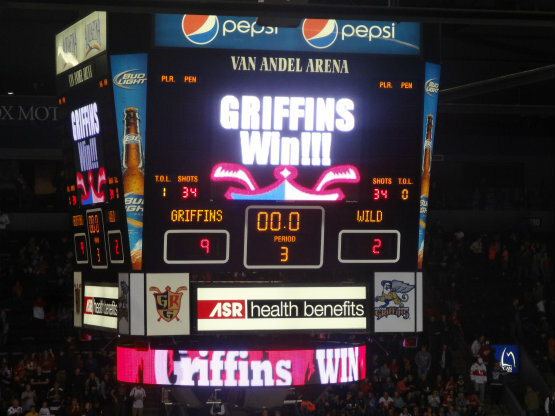 Our first Griffs game of the season, and it was a good one. They wasted no time, as Andy Meile tickled the twine just 14 seconds into the game. 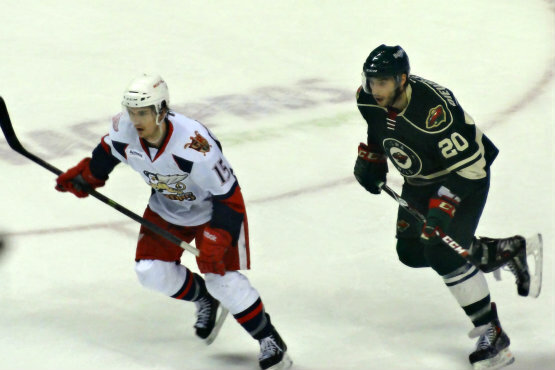 The Wild tied the game shortly after, but not long after that Landon Ferraro re-established the lead for Grand Rapids. 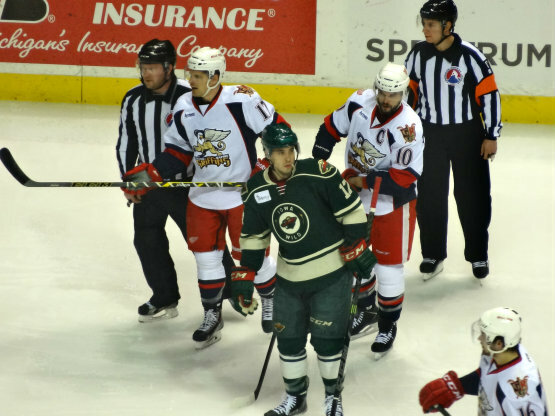 Teemu Pulkkinen scored with 43 seconds left in the period to give the Griffins at 3-1 lead going into the first intermission. During a break, I tried to take a few pics of Brian and I with my iPhone, but they didn’t turn out too great (still posted on Twitter). This one of Bri didn’t turn out too bad, though. The second period was a good one for the home team. 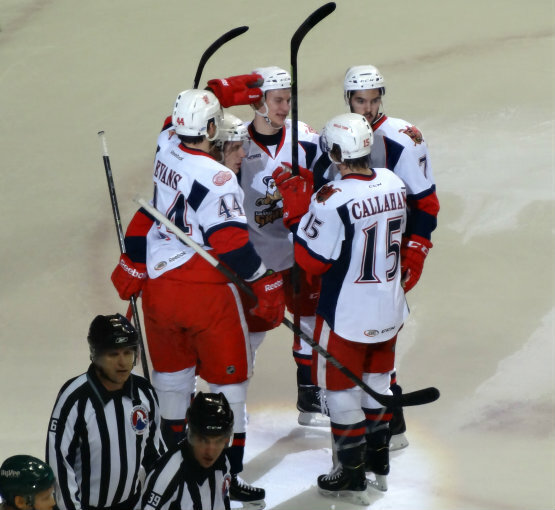 Mitch Callahan scored a power-play goal just 2:35 into the period to put the Griffins up by three. 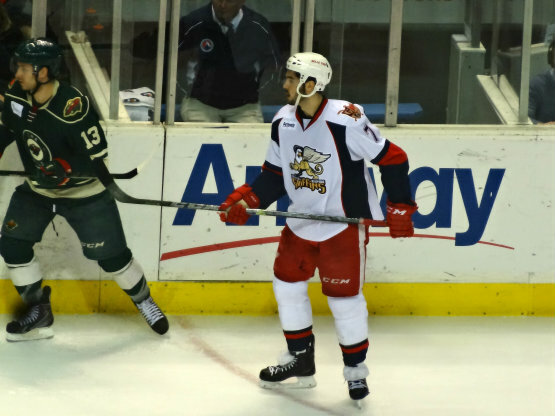 Grand Rapids kept pouring it on, as Tomas Nosek scored a highlight-reel goal, and Marek Tvrdon scored his first AHL goal shortly after. The scoring didn’t stop there, as defenseman Nathan Paetch scored on a laser from the left circle, and Nosek tapped in his second of the night to put an end to the second period. 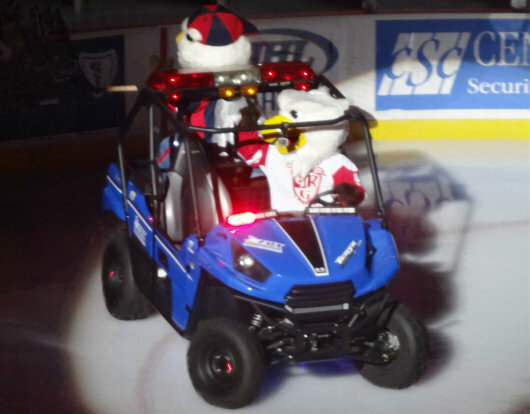 Brian and I tried to catch up with the mascots Griff and Finn, but they didn’t get out with the fans during the game or intermissions. The third period wasn’t as excited, but still held some very good stories. First, with the Wild getting beat up, they decided to finally pull their starting goalie, and replace him with David DeSandler. 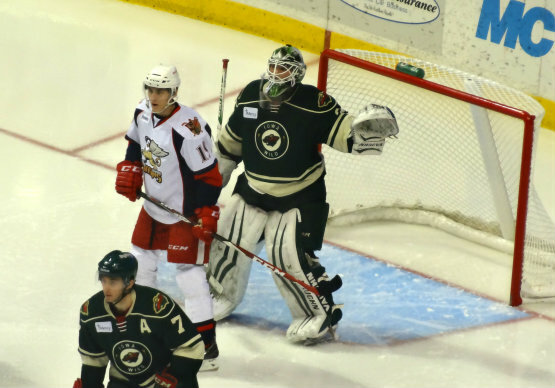 With the other netminder called back up to Minnesota, the Wild needed a back-up, and signed the west Michigan native to a one-day tryout. DeSandler did a fine job, too, only giving up one goal and making six saves in his one period of work. The only goal he gave up was to former Lake Superior State Laker Colin Campbell at the 5:53 mark. In net for the Griffs, Thomas McCollum, who was sent down from the Detroit Red Wings earlier in the day. 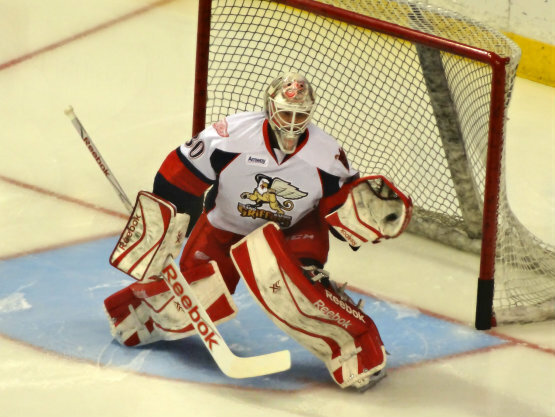 He was stellar on the night, stopping 32 out of 34 shots for Grand Rapids. Fight! Fight! Dropping the gloves!!! 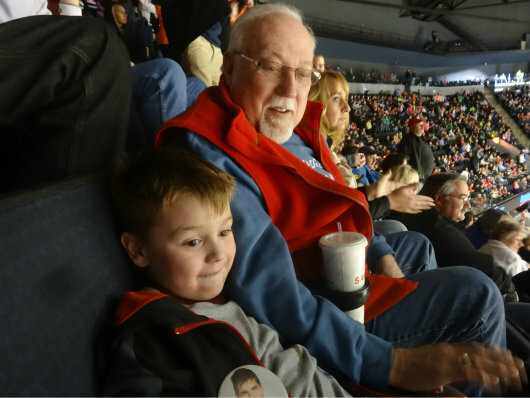 This was a fun night with family, and we hope to make it down to another game this season. As the last post of 2014, it was a great year and we really look forward to the challenges that 2015 will bring us. I’m still hoping to get transferred to a warmer, more baseball friendly environment, so keeping my fingers crossed, and see where the new year takes us! 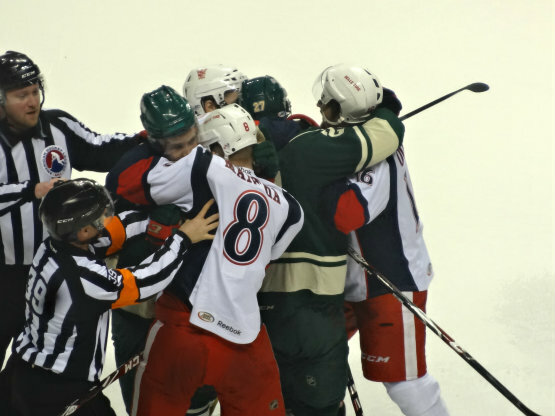 Final: Griffins 9, Wild 2.